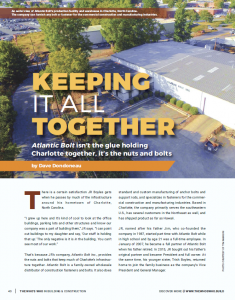 Atlantic Bolt specializes in construction fasteners. We do, however, supply many original equipment manufacturers. Below is an abbreviated list. If you don’t see it here, give us a call. This is a partial list of Atlantic Bolt products. Those items that say (call) are parts that we have in stock but have too many part numbers to list. Contact us if you can’t find it here.